The Treasure Island beaches running from Sunshine Beach to Sunset Beach are named by the locals for easy reference. Although the lines are a bit blurry along this Gulf Coast island, you'll get idea. 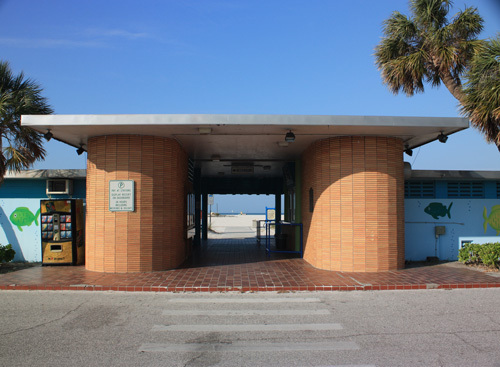 It is a bit confusing for visitors walking along the three miles of shoreline who ask a simple question, such as "Where is Sunset Beach Pavilion ?" Only to get a wave of the hand south from a local and an answer like, "Ah, it's only a few minutes past Caddy's Beach. Just keep walking, you'll find it." Caddy's Beach...say what? That's not on any map the hotel gave the visitor. Now, they're presented with finding some little beach they never heard of, just to see the setting for many beach weddings . Hopefully, this little rundown will help you cut through the confusion. This is the beginning of Sunshine Beach. I'll be brief. Do not swim, climb, or get near this thing from the water. Here are three good reasons: (1) There are strong currents near this mess and they can throw you into the rocks and break arms, legs, and ribs. (2) There are probably a million snagged fish hooks in those rocks that have broken off the line. You do not want one of those in your hands or feet. (3) The rocks contain lots of fish food. Smaller fish come to eat these. Larger fish (sharks) come to eat the smaller ones. 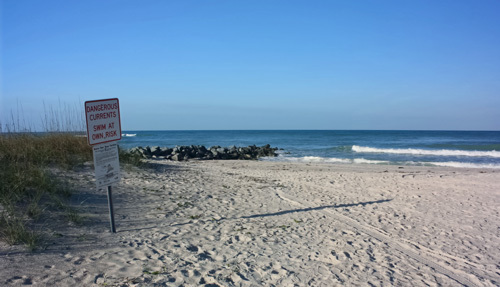 The Public Beach Access starts at Snowy Egret parking lot at 126th Avenue. It's about 100 meters south of the jetty. There are about 12 parking spaces up there. They all require quarters for the meters. Bring a handful if you plan on staying a few hours. Sunshine Beach gets its name because it parallels Sunshine Lane. It runs south to about 120th Avenue. Then, you'll come to Municipal Beach. 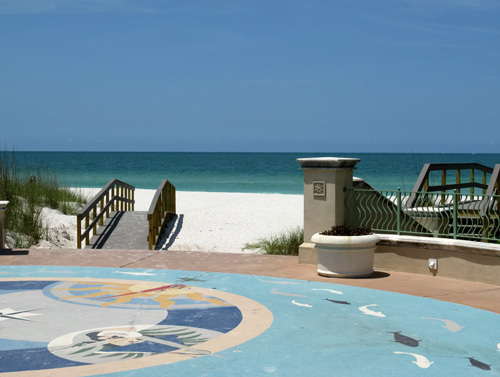 This is an easy beach to recognize from Gulf Blvd, because of the elaborate entrance at 112th Avenue. 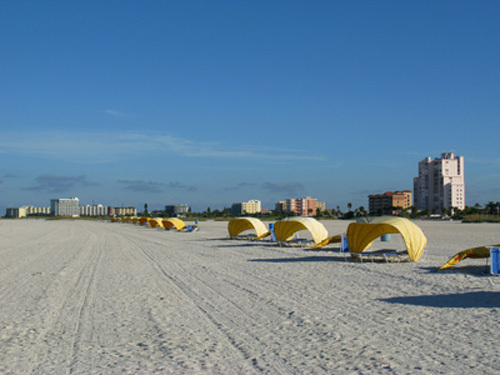 Down on the beach side, you'll start to see a few yellow cabana tents and the first large crowd of people on a very wide stretch of beach. 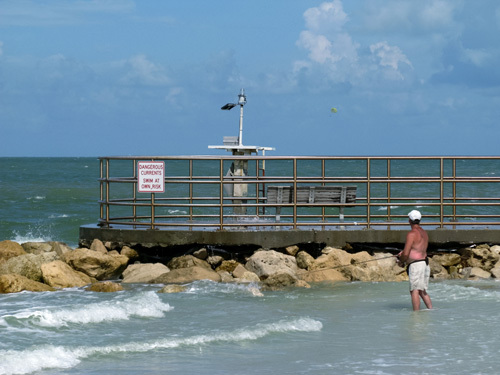 Treasure Island beaches fluctuate from areas of crowding to almost total isolation. They offer something for everyone. This beach has a snack bar and a playground for small children, as well as restroom and showers. Keep moving south and you'll see lots more of those yellow cabanas, and the huge blue lettering on the Bilmar Beach Resort Hotel. This is the most supersized of the Treasure Island beaches. It consists of mostly renourished sand...meaning it has been pumped out of the Gulf and spread on the beach. It is full of millions of tiny shell fragments. Some visitors complain this hurts their feet the first few days. You will find lots of people within a hundred meters on both sides of the entrance. This is a very popular beach. The parking lot is at 104th Avenue on Gulf Blvd, across from the Publix Market. (Be aware, some locals call this... "Publix Beach". There are outside showers and clean restrooms up by the parking lot. Walking farther south will bring you to Vista Beach. You'll recognize this little section of the Treasure Island beaches because it begins to narrow appreciably. There is a nice pavilion above the beach with showers, but no restroom facilities. 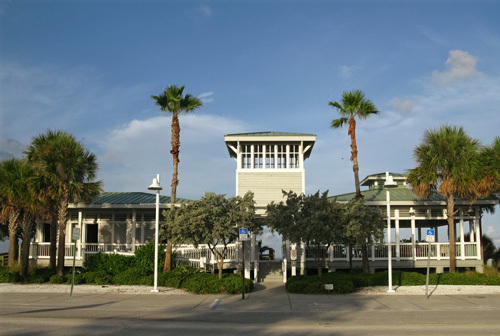 It is located right at the fork of Gulf Blvd, where it heads east towards St Pete Beach and west towards Sunset Beach. There are NO parking spaces. You have to walk here from either the north or the south. This little area is much less populated and much more quiet than our next stop along the Treasure Island beaches...the infamous Caddy's Beach. If you are into crowds of young people, target age 21-75, this beach is for you. People come in cars, on foot, and in boats to eat, drink beer, and relax in the white chaise lounges behind Caddy's Beach Bar. This place is FUN, with a capital F.
People mingle, play beach volleyball, meet someone new every few minutes, eat great food, and cheer the beautiful Florida sunsets. 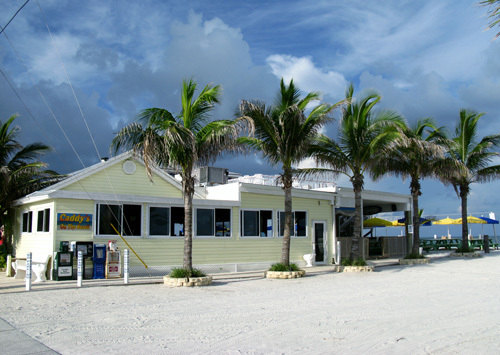 Even though there have been problems with young people being drunk in the neighborhood of Sunset Beach, Caddy's runs a tight ship with their security people. There are usually five or more circulating. You CANNOT bring coolers or even drinks not purchased on the premises to this beach. Due to the high-profile problems in the neighborhood, Security will call the city police quickly if someone decides to disobey the rules or gets mouthy. Don't push it. You can have a lot of fun on this section of beach. Parking can be a real problem around here. Caddy's has a few of it's own parking lots, but you'll get charged at least $3. Brown Pelican Lot is about a hundred yards south of the bar, but it only has a few metered spaces. 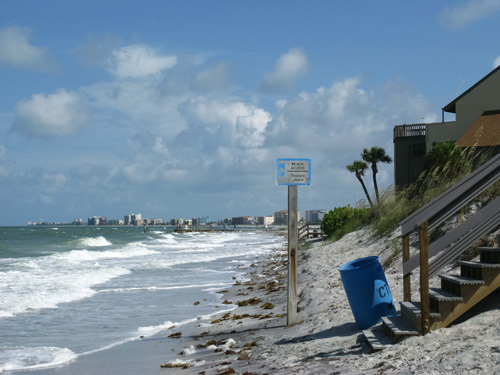 You are better off parking up at Gulf View Park Beach ("County Park Beach") and walking or swimming down to here. Brown Pelican Lot pretty much marks the beginning of Sunset Beach. You will notice this is much more narrow than the beaches farther north, but it is also far less crowded. 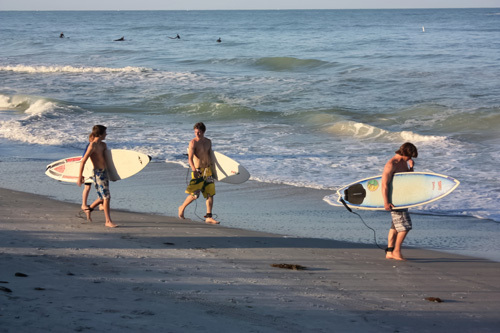 Most of the people who come here live in the neighborhood, although younger people drive here to surf. There is parking at Ring-Bill Gull Lot, which is located about 81st Avenue. Like all of the other parking places, you will need a bag full of Quarters. We're almost at the end of the Treasure Island beaches, now. Coming up will be Pavilion Beach. 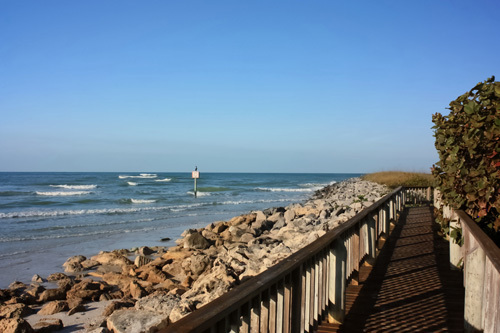 This is a popular spot for sun bathers, surfers, guys who like to fish, and young brides wanting a Florida beach wedding. It has showers, restrooms, a small playground for children, and covered picnic tables. There is also wireless Internet connection inside the pavilion structure. You can park in the metered spaces at Tern Parking Lot. The Sunset Beach Boardwalk will take you around the private condo development. You can see all of Blind Pass and the Intercoastal Waterway you want from there. Hopefully, this information will make you a little more familiar with the Treasure Island beaches. I know it seems complicated, but if you lived here year-round, it would make more sense. What do you need to know about stingray season on the Gulf Beaches? Want to learn how to become a travel writer like me?